It’s the kind of lecture you won’t hear in Arts Administration 101. In 1966, William Schuman, then president of Lincoln Center for the Performing Arts, delivered a speech before a group of economists and business leaders at Princeton University, in which he argued that the problem among arts organizations “is not that our deficits are too large, but that they are too small.” Artistic endeavors, he said, should always take precedence over financial imperatives, and it is up to boards and trustees to find ways to pay for even the riskiest programming. 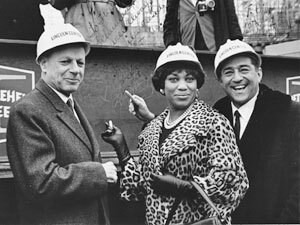 William Schuman (left) with Leontyne Price and Robert Merrill at the topping out of the Metropolitan Opera House at Lincoln Center on January 20, 1964. Schuman was the president of Lincoln Center from 1962 to 1969. 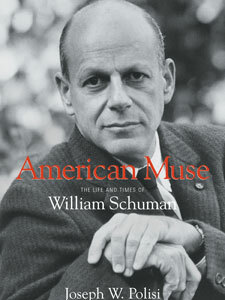 The cover of American Muse: The Life and Times of William Schuman, a new book by Juilliard President Joseph W. Polisi. At the time, the still-incomplete Lincoln Center was awash in a sea of red ink, missed construction deadlines, and internal political strife. John D. Rockefeller 3rd, its chairman, saw the speech as an assault on his leadership and the board soon began searching for Schuman’s replacement. The Princeton address is one of the many bold, contrarian acts detailed in American Muse: The Life and Times of William Schuman, a new book by Juilliard President Joseph W. Polisi. Once the most powerful arts administrator in the United States, Schuman was an idealistic, ambitious, and pugnacious figure whose list of accomplishments is formidable. Consider this: Along with composing more than 100 works in every major musical format, Schuman found time to teach at Sarah Lawrence College, serve as director of publications for G. Schirmer, be the president of Juilliard from 1945 to 1962, and head Lincoln Center from 1962 to 1969, its formative years. He became actively involved with numerous other boards, panels, and organizations; delivered speeches; and received a flood of honors, including the first Pulitzer Prize for music (in 1943, for his cantata A Free Song), as well as dozens of honorary degrees. Schuman was also a mentor and friend to Polisi—the composer’s piano may be seen in the president’s office, and a picture of Schuman has an honored place on the wall. Polisi believes that many of his educational philosophies were influenced by Schuman’s iconoclastic approach to running the School. Schuman was also determined to raise academic standards at the School. Admission auditions became more rigorous and enrollment decreased from around 1,400 students in 1945 to the low 600s by the time Schuman left in 1961. He completely reorganized the theory and composition program, sent the Juilliard Orchestra on an international tour, and oversaw the creation of the Juilliard String Quartet. While Polisi writes that Schuman was an “affable and decisive administrator,” he acknowledges that there was considerable turmoil at the outset of his tenure, when he rather heavy-handedly fired several older faculty members and replaced them with younger teachers. Polisi also concedes that Schuman’s decision to have composers teach music theory was not entirely successful, and today’s methods are vastly different. Until now, there hasn’t been a major biography covering all of Schuman’s life, but the composer’s widow, Frances (“Frankie”), was searching for an author who could tell her late husband’s life story using a collection of oral histories that he worked on later in life. Polisi stepped into that role and soon discovered that there were many other untapped research materials, from the Schuman family archives, the New York Public Library at Lincoln Center, and elsewhere. After Frankie died in 1994, he worked closely with Anthony and Andrea Schuman, the composer’s children. The book’s first chapter charts Schuman’s initial forays into composition as a teenager, a period when he composed music for the popular songs of the day (his principal lyricist was the young Frank Loesser). At age 20, he had an epiphany when he heard his first symphony concert, Arturo Toscanini conducting the New York Philharmonic in Carnegie Hall. He abandoned a career in finance and eventually enrolled in the Juilliard Summer School. In 1933, the pragmatic Schuman entered Columbia University’s Teachers College, eventually earning his bachelor’s and master’s degrees. Schuman’s 16 years at Juilliard were his most productive as a composer, thanks to the liberal amount of time he was able to devote to writing while on a schedule that often involved arriving at school after noon. This changed when, against friends’ and colleagues’ advice, he took the job at Lincoln Center in 1961. Schuman suddenly moved from genteel academia to a bastion of infighting, where he battled with Rudolf Bing, the imperious general manager of the Metropolitan Opera, struggled to confront the acoustical problems at Philharmonic Hall (now Avery Fisher Hall), and faced mounting deficits and construction delays. Polisi says that, in many ways, Schuman inadvertently helped cultivate the competition that exists among Lincoln Center’s constituents to this day by insisting that the complex function not just as an assemblage of arts organizations but as a producer of original work. This prompted concerns that Lincoln Center Inc., the governing body, would siphon off resources that could go to the New York Philharmonic or the Metropolitan Opera. Yet while Schuman resigned in 1969, it was not before he helped establish the Film Society and Chamber Music Society of Lincoln Center, and what today is the Lincoln Center Institute.